When a file is deleted from the slave first, and then from the read-only master. It disappeared and later existed again in the "out of sync" list on the master. I feel it should be excluded permanently in the list. Create 4 files 0, 1, 2, 3 on the master node. 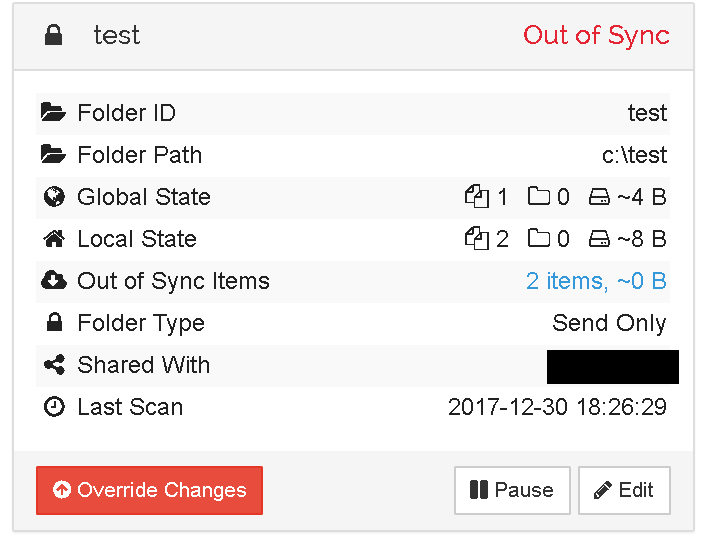 Set the folder in the master to be "send only"
Sorry, what's the issue, you deleted 2, 3 on slave, and master refuses to accept that (as it's master), hence becomes out of sync. Anyways, support is handled on the forums. I know that the state of out of sync is expected in this case. 2 is deleted from the slave and the master so it no longer exists, should it still exist in the out of sync list? Also it seems inconsistent that 2 is excluded in the count of global and local state but included in the out of sync list. If this scenario is unexpected, then this is a bug report. Otherwise, this is a feature request because an updated list may be useful when solving the out of sync. Logically it doesn't make sense, yet technically because even the state is the same, the action is initiated by different devices, hence it's out of sync. I'll leave for @calmh to answer. File deleted in send only folder. Things are in sync. It’s similar to the other issue when a new device with identical contents coming online will make a send only device fully out of sync. We should resolve the differences as long as it doesn’t result in differences on disk for the send only folder. Currently we have to press override now and then just for internal metadata reasons, which is ugly. folders, if they do not actually differ except for internal metadata. For me, is not fixed with v0.14.49 Linux (64 bit). Regression? For me the steps above result in the expected up-to-date state. Please post on forum.syncthing.net until we identified and reproduced the problem. 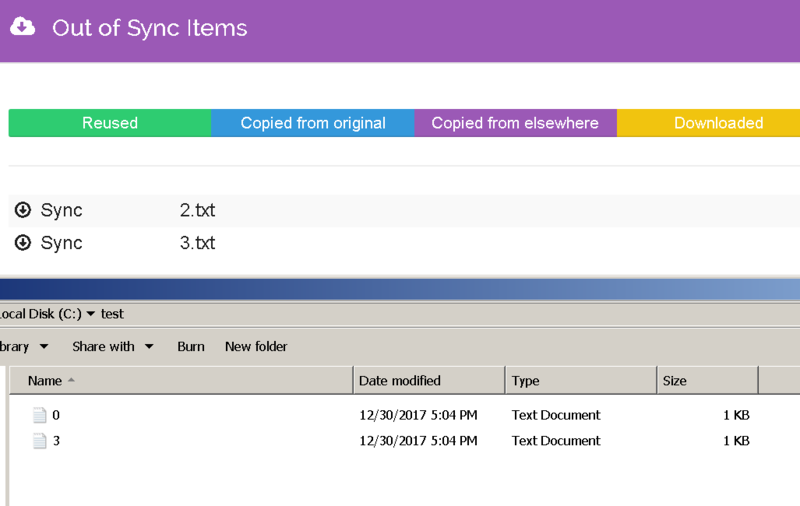 Copying a large (5GB) folder with many small files into my sync folder of host A. Then Syncthing picked it up and started syncing. .. and I think at that point I did mess up something. As this resulted in Syncthing keeping the missing files as "unsynced" state. Which is quite obvious, as the source wasn't present anymore and the marked files for deletion weren't there either. Ok, then lets move any further discussion to forum.syncthing.net please. This doesn't look like it's the same as this issue. If the cause (or reproducer) can be found, then a new issue can be opened.